Round 1- Symmetry of Proportion: Definition: Correspondence in size, shape, an relative position of parts on opposite sides of a dividing line or median plan or center of axis. Round 1- Muscularity, Definition & Separation: Competitors will perform a number of mandatory poses on command of the Head Judge. The competitors will be judged on overall muscularity and size, muscle shape and fullness, and muscle density. Definition is judged on the competitor’s distinct muscular detail level that separates the different muscle groups of their physique while attaining the mass and fullness of their muscle groups. A very conditioned and very stringy runners look is NOT acceptable in this division. Each competitor will be allowed a maximum of 90 seconds (some events will have a time restraint of 60 seconds) to display their physique, physical conditioning, and the competitors overall presentation through their posing routine. Competitor to provide posing routine music at registration.USB (Universal Serial Bus) your music must be labeled and easy to find. No cell phones. The judges will be looking for pose and coordination, skin tone, artistic presentation and high display of elegance, personality and glamour. In all rounds, competitors should maintain direct, but relaxed posture. The judging will be conducted in two equal rounds. Each competitor in the class will be given a point score with an overall tabulation of points between all rounds. Competitors will present themselves on stage in serial order in a straight line facing the judges: assuming a semi-relaxed stance with ankles touching. The head judge will instruct the group to execute a series of quarter turns to the right allowing the judges to view them from the front, left side, back and right side before returning to the front position. 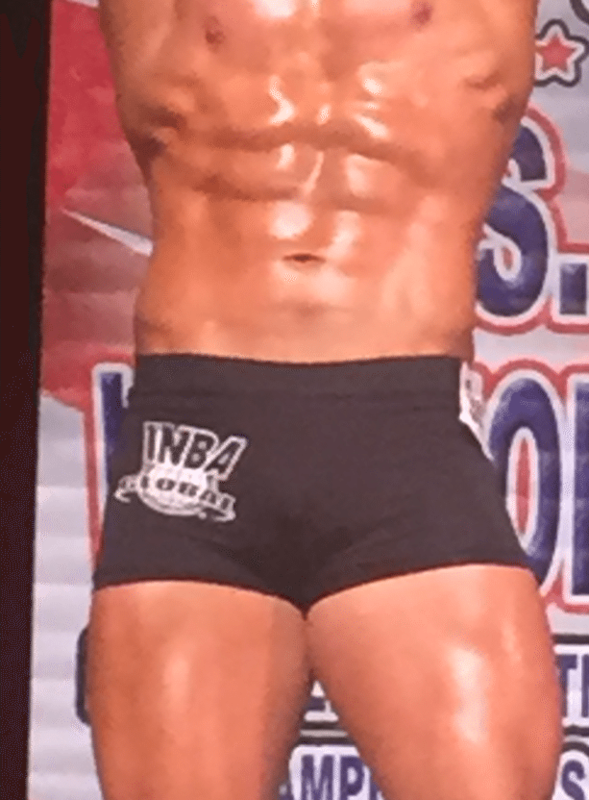 The judging is based on overall symmetry and muscle definition. 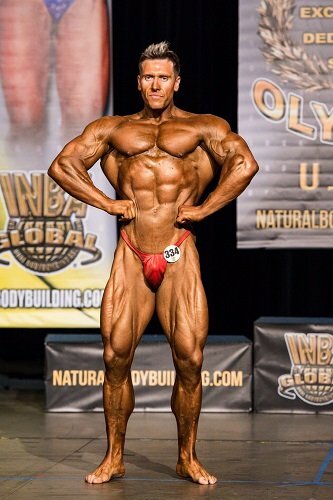 Competitors should have a good to excellent muscle tone and appear to have reasonable levels of body fat. 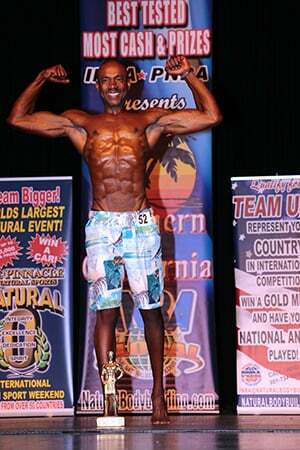 The judges are not looking for muscle mass “ripped to the bone”, extreme striations or vascularity of a bodybuilder. The judges objectives are: the competitors should have good to excellent muscle tone with reasonable levels of body fat; the physique should appear evenly developed with a high degree of attention to symmetry, proportion and overall appearance including completion, poise and overall presentation. The lean muscularity of the upper and lower extremities should flow aesthetically when viewed from all creating a balanced sculpted appearance. Competitors will present a fitness routine in active wear for a maximum of 90 seconds. They will emphasize strength, flexibility and endurance. The routines are meant to give the judges some idea of the competitor’s physical condition and abilities. It also gives the competitor the opportunity to express their creativity, personality and interests. Competitors are encouraged to include a talent or interest they may have such as dance, martial arts, jumping rope, baton, gymnastics, aerobics, etc Props may be used. Please note competitors are not expected to be gymnast. Although, routines are to be high energy which includes movements demonstrating strength, flexibility and endurance, gymnastic tumbling and/ or acrobatics is not required, and judges will not penalize competitors that do not display gymnastic ability. Judging objectives are: high level execution of movements, including full extensions. Execution of movements should appear effortless; adequate use of props of audience awareness. (This also includes audience participation and stage presence; projection of personality and creativity. Judging Criteria is based on symmetry, athletic definition, and stage presence. Each competitor will be allowed a maximum of 90 seconds (some events will have a time restraint of 60 seconds) to display their flexibility, strength, and endurance. Competitors can perform any activity they have excelled in. (i.e. bodybuilding, martial arts, gymnastics, dance, aerobics, ANY fitness activity) Competitor to provide posing routine music at registration. CD in audio format. Consists of two rounds in a group comparison presentation. Judging Criteria is based on symmetry, muscularity, definition, (conditioning) and stage presence. Men’s Physique has less Muscular Mass than Men’s Bodybuilding. 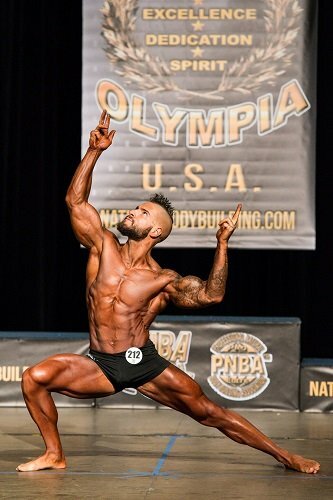 Competitors will make quarter turns to the right on command while in their “Physique Stage Stance” The lower torso is exempt from being judged. Round 2- Muscularity, Definition & Separation: Competitors will perform a number of mandatory poses on command of the Head Judge. (Not Allowed: Front Lat Spread, Crab Most Muscular) The competitors will be judged on overall muscularity and size, muscle shape and fullness, and muscle density. Consists of Two Rounds: Group comparison and posing routine. Round 1- Symmetry of Proportion: Definition: Correspondence in size, shape, and relative position of parts on opposite sides of a dividing line or median plan or center of axis. 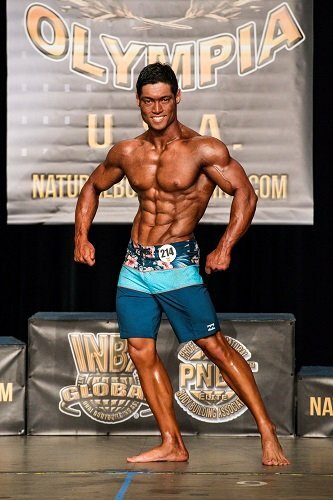 Round 1- Muscularity, Definition & Separation: Competitors will perform a number of mandatory poses and “Classic Physique” poses on command of the Head Judge. The competitors will be judged on overall muscularity and size, muscle shape and fullness, and muscle density. Each competitor will be allowed a maximum of 90 seconds (some events will have a max of 60 seconds) Creativity and “Classic Physique” Pose(s) must be portrayed in posing routine along with presentation of physique and physical conditioning in the overall routine. Competitor to provide posing routine music at registration in a USB (Universal Serial Bus) your music must be labeled and easy to find. No cell phones. Each competitor will be allowed a maximum of 90 seconds (some events will have a time restraint of 60 seconds) to display their physique, physical conditioning, and the competitors overall presentation through their posing routine. 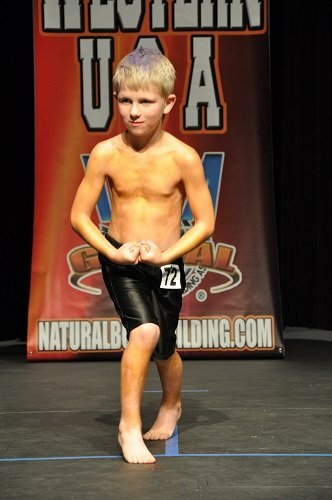 Competitor to provide posing routine music at registration. CD in audio format. 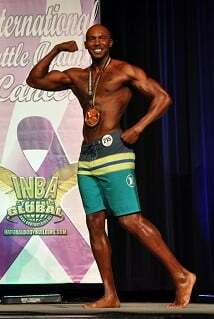 Judging Criteria is based on presentation, overall suave, personality, athletic conditioned body, and marketability. The competitor will need to deliver a 30 second speech on their philosophy of fitness. Round 1- Consists of T-Walk OR I Walk , and a 30 second speech on the competitor’s philosophy of fitness. Symmetry of Proportion: Definition: Correspondence in size, shape, and relative position of parts on opposite sides of a dividing line or center of axis. 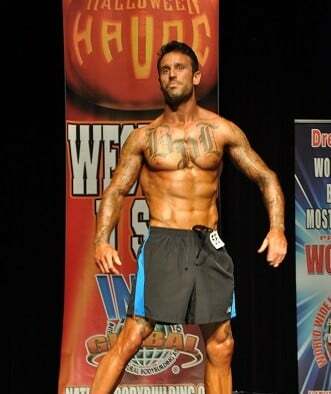 Judging Criteria is based on an athletic/model look without the use of heavy weight training. Men’s Beach Body has less Muscle Mass than Men’s Physique. Description of Quarter Turns: Quarter Turn Right Head and eyes facing the same direction as the body, heels together, knees together and slightly bent, stomach in, chest out, shoulders back, left arm hanging relaxed and slightly back from the center-line of the body with a slight bend at the elbow, right arm hanging relaxed and slightly front of the center-line of the body with a slight bend at the elbow. The positioning of the arms will cause the upper body to twist slightly left with the left shoulder lowered and the right shoulder raised. Quarter Turn Back Head and eyes facing the same direction as the body, heels together, knees together and slightly bent, stomach in, chest out, shoulders back, both arms hanging relaxed and at the side along the center-line of the body, elbows slightly bent, tips of the fingers at the hips (no further than 6 inches from the body). Quarter Turn Right Head and eyes facing the same direction as the body, heels together, knees together and slightly bent, stomach in, chest out, shoulders back, right arm hanging relaxed and slightly back from the center-line of the body with a slight bend at the elbow, left arm hanging relaxed and slightly front of the center-line of the body with a slight bend at the elbow. The positioning of the arms will cause the upper body to twist slightly right with the right shoulder lowered and the left shoulder raised. Quarter Turn Front Head and eyes facing the same direction as the body, heels together, knees together and slightly bent, stomach in, chest out, shoulders back, both arms hanging relaxed and at the side along the center-line of the body, elbows slightly bent, tips of the fingers at the hips (no further than 6 inches from the body). The finalists of each contest qualify to compete in September at the Team USA Championships and become a part of the team. 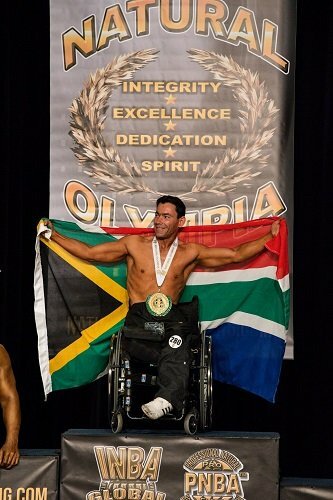 Team members will their country at international competitions such as the World, Natural Universe, and Natural Olympia. Consists of Two Rounds in a group comparison & posing routine. All rounds are judged. Judging Criteria is based on the pairs symmetry, muscularity, definition, (conditioning) and stage presence. Round 1- Symmetry of Proportion: Definition: Correspondence in size, shape, a relative position of parts on opposite sides of a dividing line or median plan or center of axis. Each Mixed Pair will be allowed a maximum of 90 seconds (some events will have a max of 60 seconds) Creativity and Synchronized Pose(s) must be portrayed in posing routine along with presentation of physique and physical conditioning in the overall routine. Competitors to provide posing routine music at registration in a USB (Universal Serial Bus) your music must be labeled and easy to find. No cell phones.